You have no idea how much good stuff I have heard about Saltie. From the internets to the people I know. 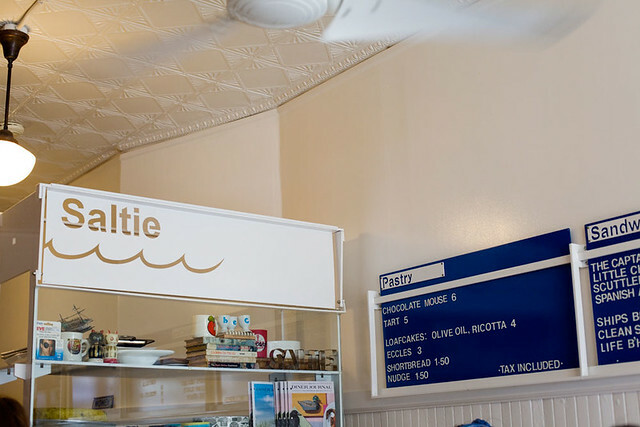 I’ve been wanting to go to Saltie for a while but it wasn’t till one of my friend, super picky eater, told me that he likes Saltie that really made me want to go that instant. One random Sunday I had to run to Williamsburg for errands and decided to check out Saltie. I walked in to find a near empty place except for 2 girls sitting by the window and a couple that seem to know the owners. The place was chilled, roomy and bright. I wasn’t sure what I wanted but I randomly got the Spanish Armada sandwich. I noticed they raised the prices of their sandwiches by a dollar compared to what it is on the website. Maybe they need help updating their website? If so I can help! Gimme a call! Within a minute after I placed my order I got my sandwich. 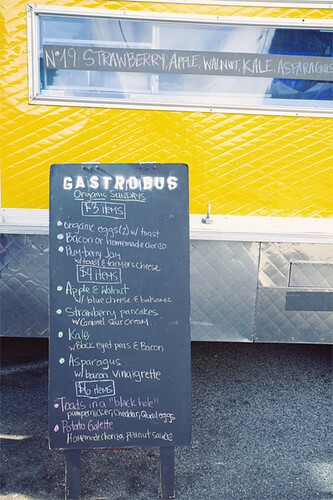 Besides the Buttermilk Truck, another truck I just had to go was the Gastrobus. Yes I have been to the Gastrobus twice (here and here) but well Antonio and Lana are just such great people. I just had to give them a visit and so should everyone! I wanted my whole family to try so I brought them along. Which also mean I would be able to try a lot of the dishes that day heehee. 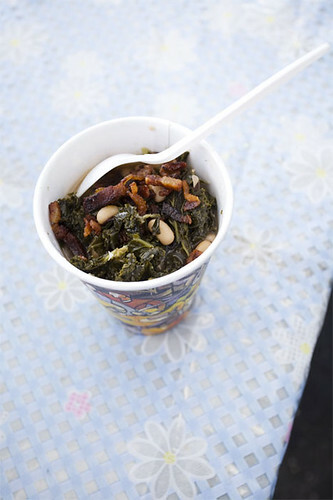 It was their organic Sunday menu so they were parked at the Los Feliz farmers market at the post office parking lot. Last time I saw Antonio and Lana it was in September so I was glad that they still remembered me when I arrived at the truck. Lana and I chatted a bit before I placed my order. Well I pretty much ordered everything off the menu, like I said I wanted to try them all! I don’t know about you but I have a hard time finding places to take family/relatives to. I don’t really go out that much and when/if I do go out I tend to go to places I’ve been to many many times or places near my apartment. The weekend before my older sister was here, my cousin and aunt from Vancouver were in town. I wanted to take them to a place where it felt New York. Of course, in my head, I ran through all the nice restaurants I’ve been to and there aren’t that many. In the end I took them to Prune. I hope they liked it. So a weekend later, my older sister was in town again for a wedding photo gig. Taking my sister around is a lot easier because I usually just take her to places I wanna go to. Easy! 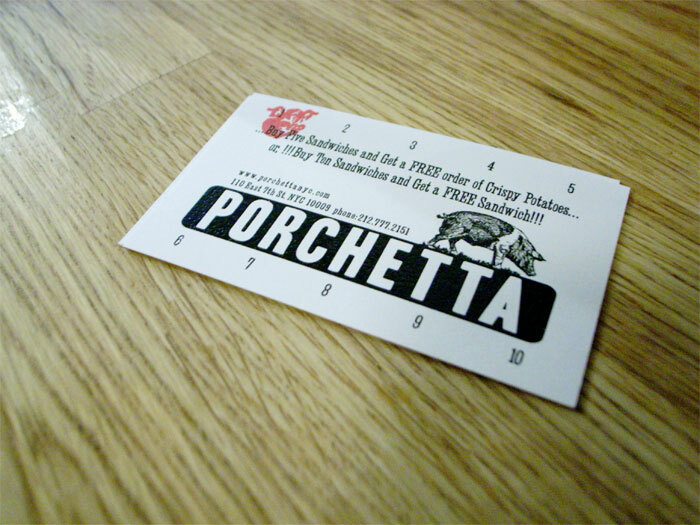 Few weeks ago I was walking around the East Village and finally found Porchetta. Never knew where it was exactly but I’ve been wanting to go. Anyways so I mentioned it to my sister and she said, yeah whatever. She quickly changed her yeah whatever to OOOOOOHHHHH when I showed her the post and photos from A Gluten Free Guide. Bacon fat bacon fat bacon fat bacon fat! After frying bacon you always end up with a pan of bacon fat. 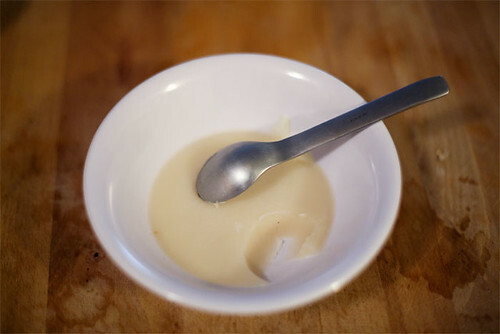 I usually pour it into a bowl and let it solidify for easy disposal. But last weekend it was different. I was preparing to make some brunch. I had a loaf of Italian bread, eggs and leftover potato mush, meatballs and parsnips. 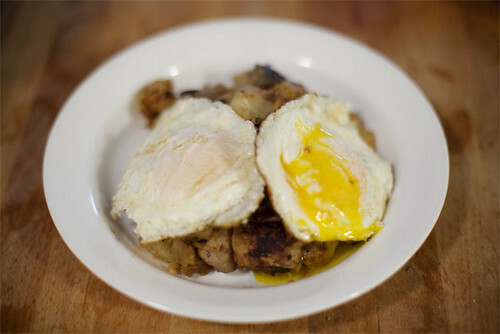 I was going to saute the potatoes, parsnips and sausages together then top it off with over-easy eggs. When I opened the fridge to get the stuff I noticed my bowl of solidified bacon fat sitting there. Should I? Should I? Heck yeah! I cut about 1/3 of the bread then sliced it into 2 halves. Heated up a pan and scooped a spoonful of bacon fat into the hot pan. 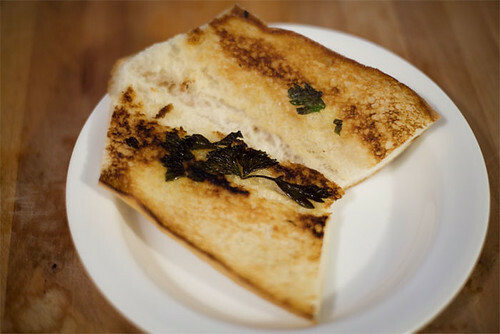 I had some parsley so I threw that into the fat and lay the 2 halves of bread on top. I toasted the bread until golden then flipped them to toast the other side. Hmmmm. 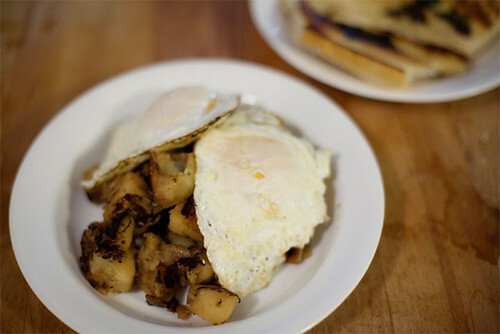 After the bread was done, I added a little more bacon fat and sauteed the potatoes, parsnips and sausages. I bought a big bunch of dill so I threw in some dill just for the heck of it. After that was done I cooked the 2 eggs. Yay for brunch. I took a bite of the toast and I really tasted the bacon in it. Quite good! I think I’ll go buy more bacon and collect enough bacon fat to fill up a jar. Once a month I would tell Howard that “damit we need to go here and here and here and here before 2009 ends!” And he would say “sure sure sure and when when when?” And I would say “how about this on that day and that on this day?” But in the end we either ended up either doing something else or we get lazy or I get lazy. But damit not this time!! I don’t remember how long it has been since I first wanted to eat at Roberta’s. I only remember Howard liking it and Mr. Paulie Gee is a fan as well. 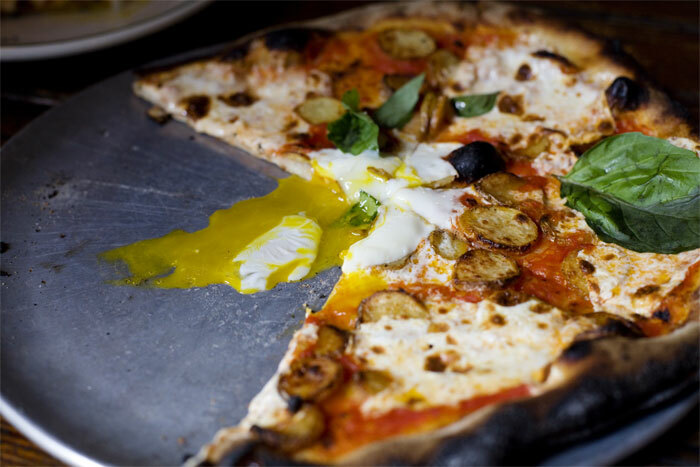 We had came up with an awesome idea to travel around Brooklyn to try many pizzerias on Labor Day. Our friend, also another pizza fanatic, offered to drive so that we can make it to as many places in one day as possible. We had 5 places on our to-go map but by the end of the day we only made it to 2 plus 1 unplanned spot. The biggest problem we ran into was the West Indies Parade that took place on Labor Day. We were mostly stuck in traffic and trying to figure our way around Brooklyn. The other problem that we ran into, which was more obvious, was that it was a holiday and the restaurants would be closed. The third problem of this whole pizza tour was that it was a pizza tour. How the hell would it be a good idea to eat at 5 different pizza places in 1 day? We had decided to only order 1 pie and each of use will only eat 1 slice. As you read on, you will know that we didn’t follow that rule. 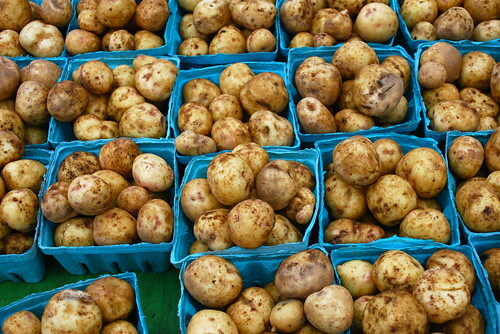 In this time of “economic uncertainty” we should give the humble potato its due. I prefer smaller potatoes if I’m eating them whole, I think the smaller ones have a more concentrated potato flavor. 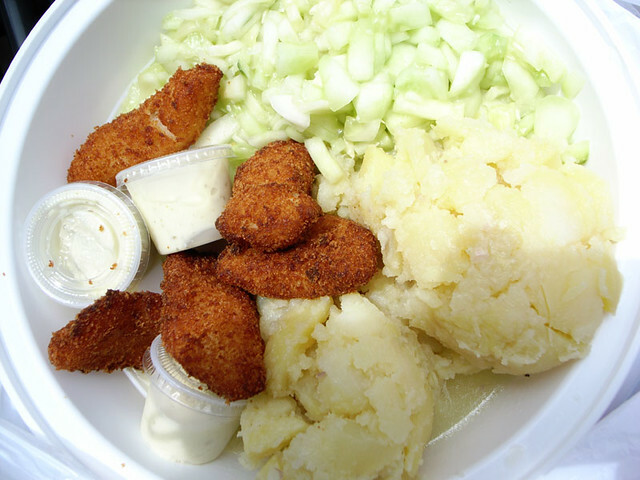 Of course, the bigger ones have their uses too: french fries, mashed potatoes, hash browns, gratins, potato salads, and much more. I think the only thing you can’t do with potatoes is eat them raw.